Don't worry, you read that right. Seventy-seven thousand and eight hundred dollars. 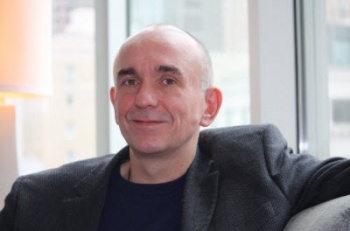 Having recently quit Lionhead Studios to found a new venture called 22Cans, legendary British game developer Peter Molyneux is on a mission to understand human behavior. This mission includes, it would seem, the creation of a one-off piece of DLC priced at $77,838 (Â£50,000) for his next game, social media "experiment" Curiosity. Curiosity, gameplay-wise, is based on a single black cube placed in the middle of a bare room. Players will be asked to chip away at the cube, fracturing it. Fractures inflicted by other players will appear in tandem with those you inflict, with everyone working together to reveal the grand mystery at the heart of the cube. Here's the catch: only the player who lands the last fracture before the cube cracks open will get to see what's inside. The number of fractures required to reach this point is known only to 22Cans, but is apparently huge. To up your chances of being the one to see the contents of the cube, you'll be able to purchase an iron chisel 10 times stronger than your normal one for 90 cents (59 pence) or a diamond chisel 100,000 times stronger than said basic chisel for the princely sum of $77,838 (Â£50,000). While iron chisels will be readily available, only one diamond chisel will be up for sale. "It's an insane amount of money," says Molyneux. The aim of the diamond chisel is experimental: Can curiosity alone drive one player or a syndicate to spend that much money? "This is not a money-making exercise; it is a test about the psychology of monetization," he added. There are many layers to Curiosity's experimental streak, including how the eventual seer-of-the-inside-of-the-cube will explain its "truly amazing, absolutely unique" contents to the world at large. "We will rely entirely on social media," explained Molyneux. "How will this person prove it? That in itself becomes a fascinating aspect of this experiment." Curiosity will be the first of 22 such "experiments" designed to examine the psychology of social media users. The results of all the experiments will be used by Molyneux to inform the design of a game he intends to release in two years' time. While this little game and its singular diamond chisel do have more than a whiff of the MolyJam about them, the concept is really interesting. Will anyone, or a group, be willing to spend that much money just to up their chances of being the one to see inside the box? Will the person to crack it open be someone who has spent days tapping away, or will it open on the first measly tap of some newcomer? What if it takes years? What if it never opens? Or what if it does open, and all we find inside is a voucher for Fable: The Journey with a smiley face scrawled over it? What have you done, Peter Molyneux? If you can handle the weight of this black-boxed mystery, Curiosity is set for release on PC and mobile devices within the next six weeks.